It’s not even Thanksgiving for some of you, yet here I am with another Christmas themed video. 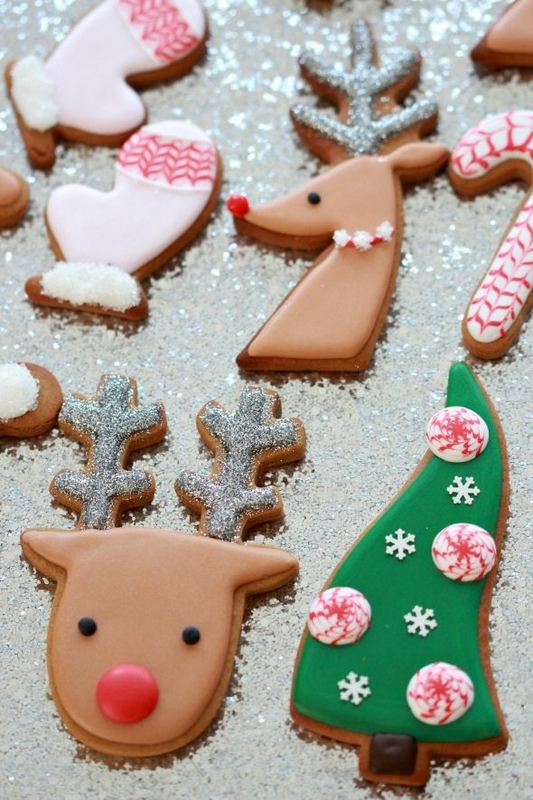 I hope you don’t mind that I’m a preparing early and have more holiday-themed cookies to share with you. These ones are fairly simple to make and I find them so endearing. Thanks to Meri Meri for most of the design ideas and adorable cookie cutters, which I found at How Sweet is That?’s shop. 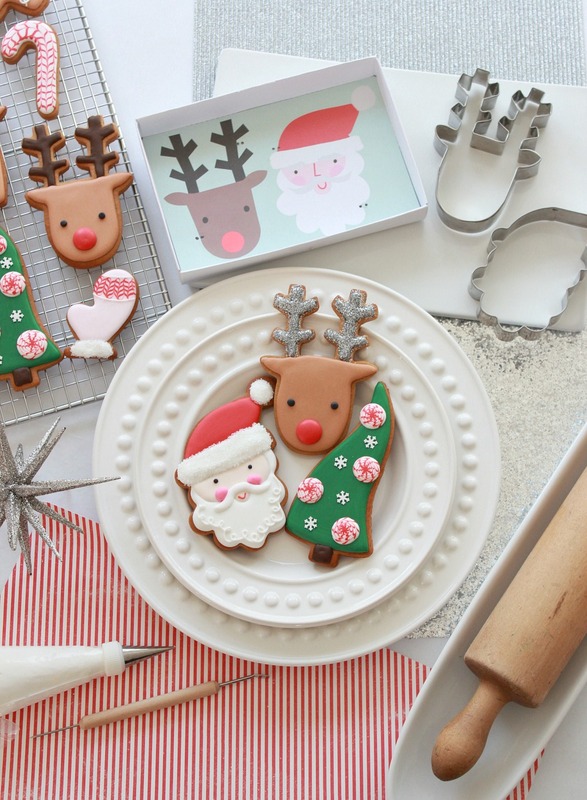 If you’d like to start baking and decorating early, click on the links to find posts on freezing cookies, thawing cookies and the shelf life of cookies. I also have some exciting news for you regarding a holiday giveaway! You’ll find the details after the tutorial info. below. 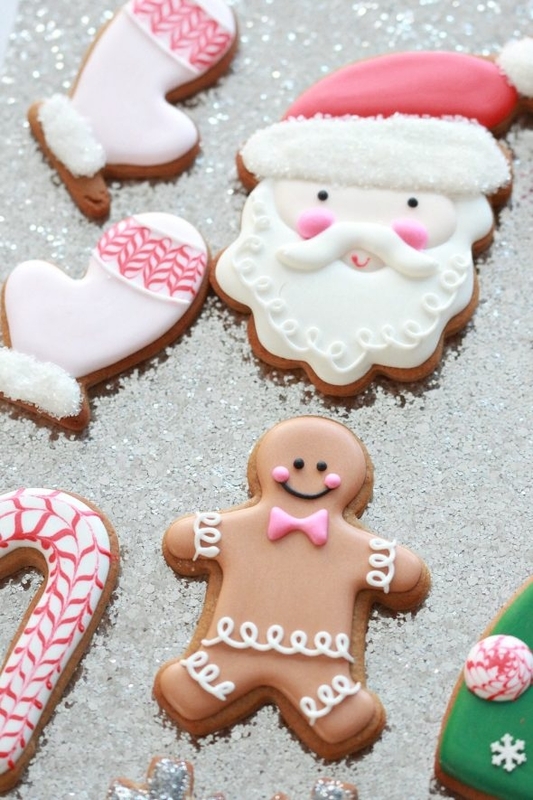 For more detail on how to make royal icing transfers (the little “peppermints” I made for the trees), this post here explains how to near the bottom half of the post. The trees are inspired by stickers. More explained in this post. Thanks for your feedback on Instagram regarding the size of Rudolph’s nose. 🙂 I ended up mainly going with the smaller red candy, but the larger one is definitely fun. I used non-edible silver disco dust in the video because I had it on hand, and some of the cookies are for demonstration purposes and the others are going on a friend’s tree. You can buy edible sparkle here. Just make sure it’s labelled as edible. I can’t find the exact mitten cookie cutter online, I originally bought it at Target, but you can find similar ones here. The video is in fast forward for the sake of time, but if you have any questions about the decorating process, please feel free to ask below! One person is going to win ALL of those prizes! I would be excited to enter, and can’t wait to share the giveaway with you! 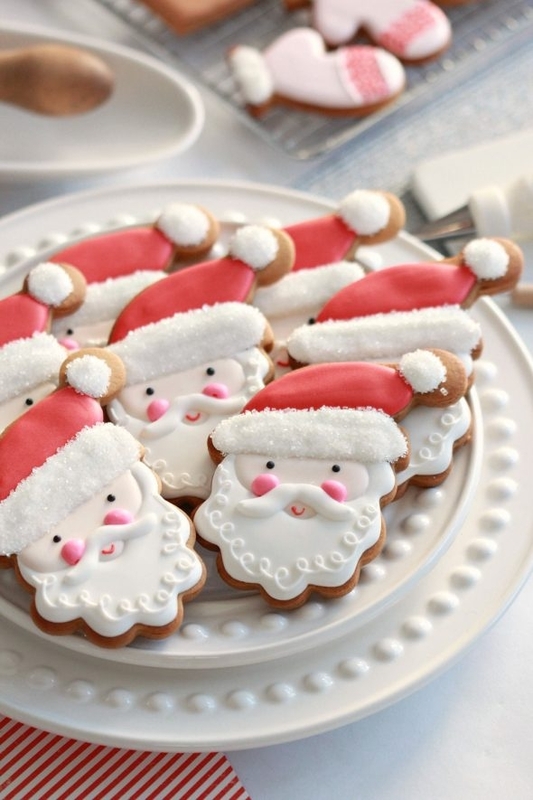 Your cookies are amazing! You make it look so easy! 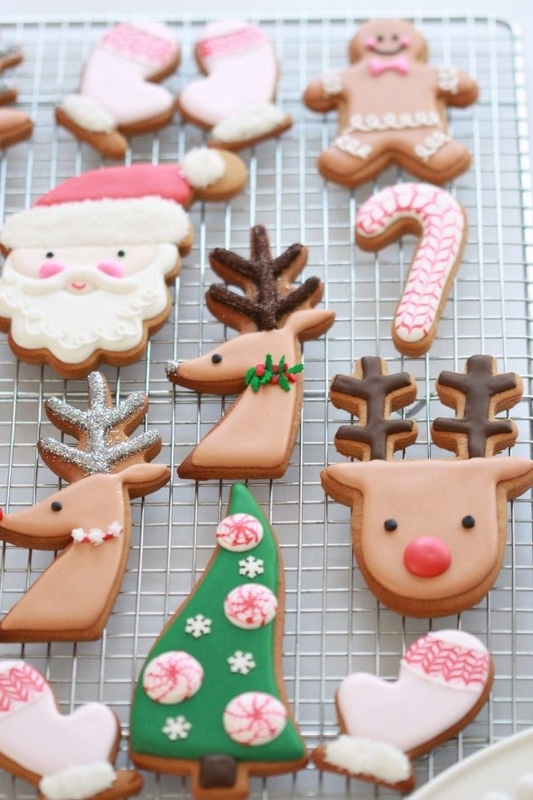 Your cookies look truly amazing! Can you tell me where I can find these fabulous cookie cutters? Thanks! I have listed the sources I can find in the blog post. There are a few that I can’t find online anymore, so have put similar links. Hope that helps! 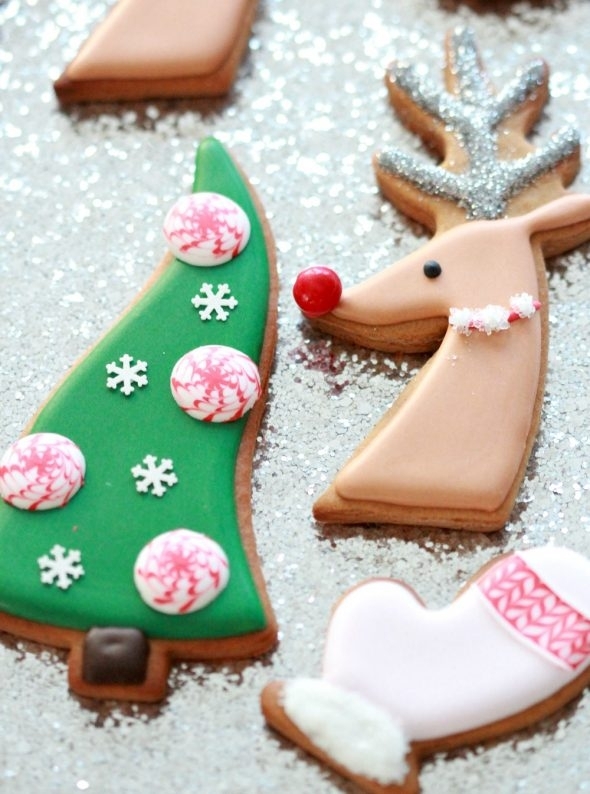 Beautiful creative amazing Christmas cookies again! You make it look so easy to do. The video is very well done. I love the background melody! NOW, I just hope for a study hand like yours!!!! Thank you for taking all this time to teach me your admiring talents. I hope it’s not to late to enter, and this is the right place. 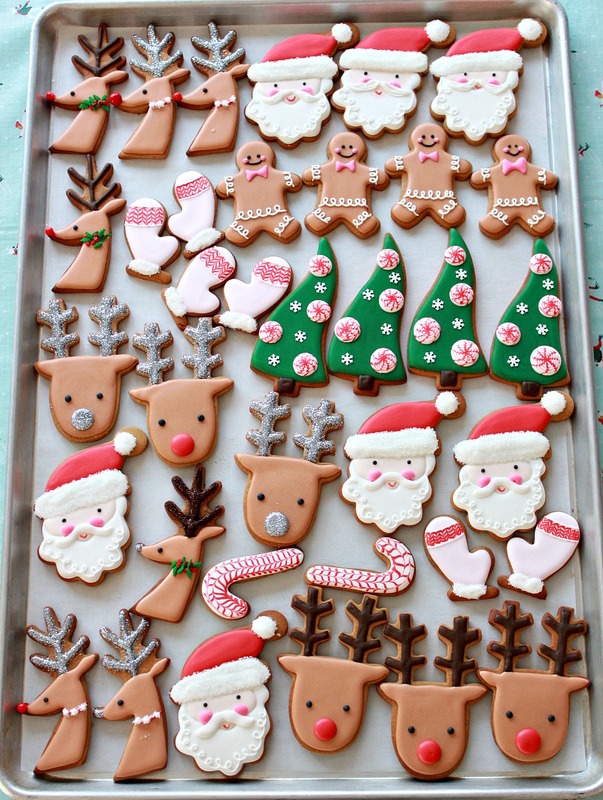 Just got started decorating cookies and this would be a great help. wow thats all i can say and thank you for the inspiration and links to buy the supplies so excited to get started!!!! Wonderful, I’m so glad to hear it! It will depend on how thick yours are, but in my oven, with my gingerbread cookie recipe (and you can see how thick they are), it was 12 minutes. 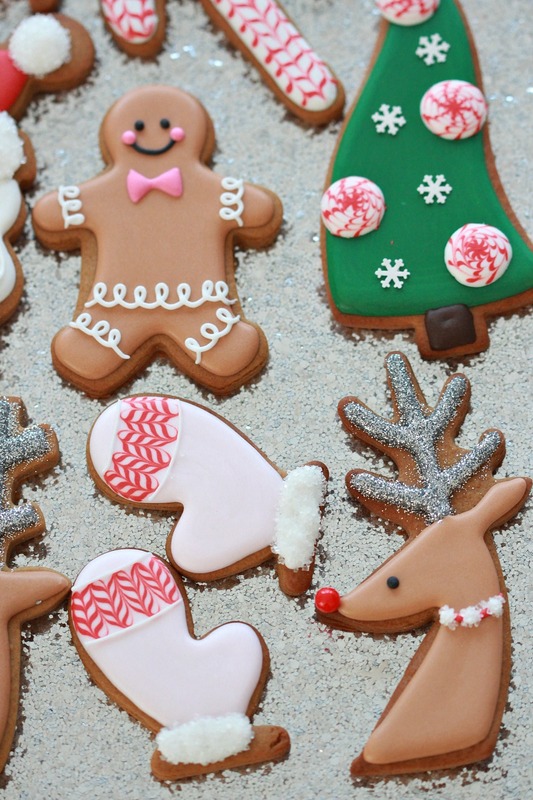 I would like to know how you make all your royal icing colors. Especially black! Beautiful! Going to attempt these next weekend ! Also love the white plates with the puffy dots around the edge – where did you find those? I got the plates from Home Sense, this season, so they should be there if there’s a store near you. Love these cookies! Is the snowman’s face a different color than his beard? If so, what color? 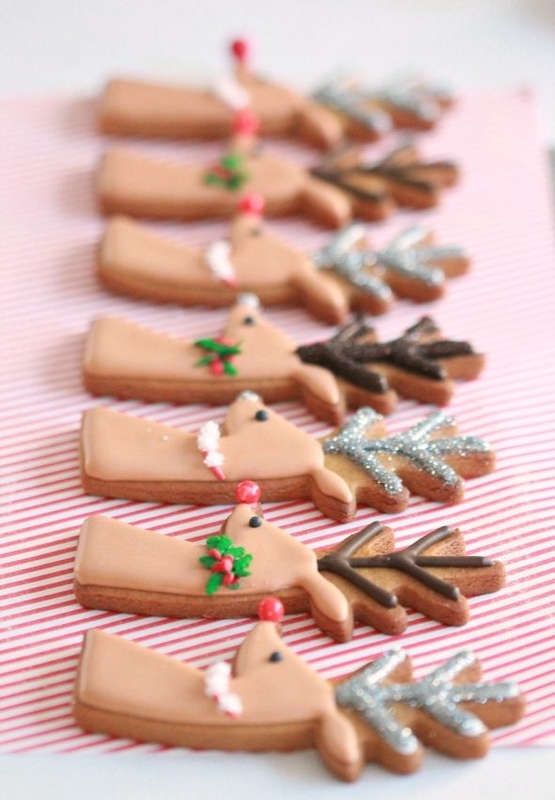 Also, how do you get the shade of icing for the reindeer? Thank you Carolina! Yes, Santa’s face is a little beige. I used Wilton ivory, and for the reindeer, Wilton brown. Hi Kel, thank you, I do appreciate you taking the time to comment! 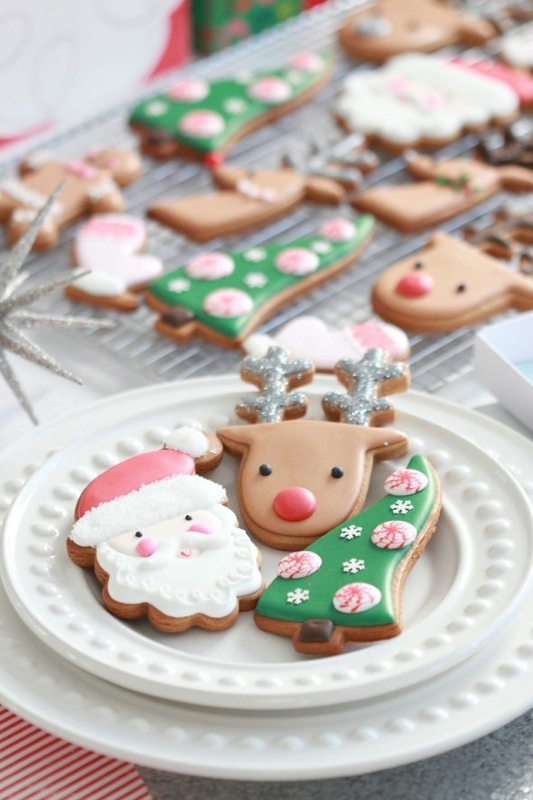 I stumbled across your site and am COOKIE HEAVEN! I’m literally running out the door to get supplies & make these. I hope they can look half as good as yours do! Thank you so much for sharing!!! Alexis, you are so cute! I hope you have fun and feel free to ask me questions here if you have any… I’ll do my best to answer quickly. So cute they r…really nice to see this..amazing..
Hi Marion! I’ve looked through your links but didn’t see one for the side Reindeer cutter, did I miss it? Thanks! 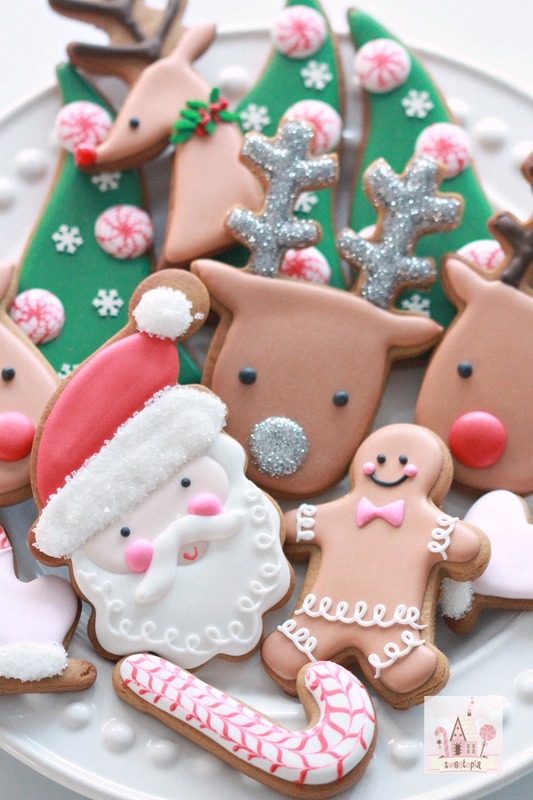 Your cookies are beautiful! Looks easy when you do it, but I can only imagine how long it would take me to make them look so good. Yes, I linked to the general pages of each cookie cutter shape because sometimes Amazon sells out of the specific cutter if I link to it. Which shape(s) are you looking for and I can share some specific links here in the comments. Hello, I watched your video tutorial on these cookies. I was wondering about the swirls on the Santa’s beard. You made a note of the icing being “thick icing”. Did you mean a thicker consistency than 10 second icing? Could you please share how many seconds thick icing would be? I was also wondering if you believe in drying the cookies under a fan or allowing them to dry at room temperature without anything else? Sure, the icing that is thick will make a peak if you dip and lift a spoon out of it. Explained another way; dip a spoon into your icing, lift the spoon out and pull away… If the icing you just lifted the spoon out of leaves a little peak that doesn’t disappear back into the icing, you have thick icing. Thank you for taking the time to explain it! Hi Marian, is your wavy tree cutter 6.5” or 5.5” long please?